Greece will shutter banks and limit withdrawals after the ECB refused to increase funding. That could help leader Alexis Tsipras convince Greeks to back euro exit in a July 5 referendum. The ECB could counter by maintaining its loans even if Greece defaults on the IMF this week. 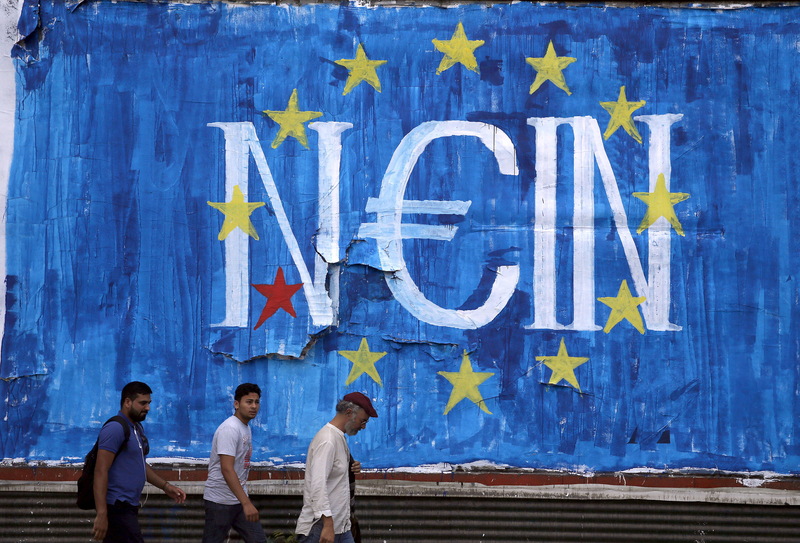 Men walk by fresh anti-EU graffiti in Athens, Greece June 28, 2015. Greece will keep its banks closed on June 29 and limit cash withdrawals, Prime Minster Alexis Tsipras said on June 28. The move follows a decision by the European Central Bank not to increase emergency funding for the country’s lenders after Tsipras said on June 26 the country would hold a referendum on whether to accept conditions for Greece’s bailout, and euro zone finance ministers refused to extend the current rescue programme. Greece needs to agree terms with euro zone creditors and the International Monetary Fund to repay the IMF 1.6 billion euros on June 30. Greek banks have borrowed 89 billion euros through ELA to meet deposit outflows. The referendum will be held on July 5. The Greek financial stability council on June 28 recommended keeping automated teller machines (ATMs) shut on June 29 and limiting withdrawals to 60 euros a day once they reopen on June 30, a source who took part in the council’s meeting told Reuters. The recommended limit will apply to holders of Greek bank cards. Foreign card holders will be allowed to withdraw the maximum limit set by their banks, the source said. “The council recommended a bank holiday of six working days until Monday night next week. ATMs will not operate tomorrow, will open again on Tuesday,” the source said.